alaTest has collected and analyzed 2826 reviews of Samsung BD-F7500. The average rating for this product is 4.4/5, compared to an average rating of 4.6/5 for other products in the same category for all reviews. Comments about the size and design are overall positive. The price and usability also get good feedback, whereas there are some less positive reviews about the reliability. We analyzed user and expert ratings, product age and more factors. Compared to other products in the same category the Samsung BD-F7500 is awarded an overall alaScore™ of 91/100 = Excellent quality. The Samsung BD-F7500 looks great and has tons of features, but a few quirks and a high price tag hold this Blu-ray player back. Lots of features. Attractive design. Expensive. Video processing quirks. Screen mirroring is limited. 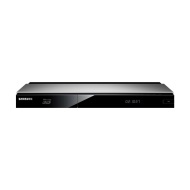 Samsung revealed its new flagship Blu-ray player at CES 2013, capable of upconverting content to 4K and a nifty reverse-AirPlay streaming-video feature. The Samsung BD-F7500 Blu-Ray player is expensive, but offers premium looks, superb Smart TV and networking, plus 4K upscaling. A superb 3D Blu-ray player with features galore and a revamped GUI. There’s an optical digital audio output for good measure and an Ethernet port for making a wired connection to the internet, although with a built-in Wi-Fi adapter on board this probably won’t be called into action. The Samsung BD-F7500 is an impressive machine in terms of specification, but ultimately that isn’t enough to outweigh our disappointment with its performance.